This recording was made in Kenmore Presbyterian Church in Buffalo, N.Y. in 1951 on an organ build by Schlicker in collaboration with Robert Noehren. 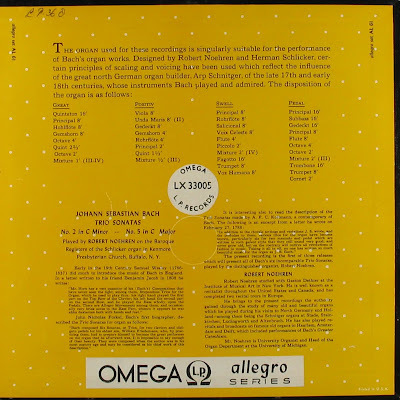 I’ve inserted the back cover of the LP below. In many respects his organ playing resembles that of Helmut Walcha. It’s clear, intelligent, fluent and a bit restrained. The performances are logical and performed with great control and with a delicate sense for lines and polyphony. The slow movements are beautifully shaped with a very vocal phrasing and the fast movements are never rushed. Thanks a lot for sharing this valuable information. I appreciate it. Robert Noehren was a really great man. He did much useful work for us. Thank you! I was surfing, inspired by one of Noehren's compositions that I'm playing for church tomorrow, which is Pentecost Sunday. Noehren was my sister's organ teacher at Michigan. Of all the IHORC recordings I have heard, I think this LP is my favourite along with the Walcha set. I agree that Robert Noehren plays a similar way, not obviously "flashy", but very musical and beautifully-phrased. I would like to hear more Noehren recordings if they are available - thanks for this set in the meantime.